daily dose of spazz: Yes, I still make stuff! Yes, I still make stuff! Images from Michele, so I haven't a clue who makes these stamps, but I'm sure she could tell ya. Both colored with the 'ol Copics, these were a couple of my earlier trials. Does anybody else think that giant banana looks...weird? Maybe I'm the only one with a guttermind...but it made me laugh. I made some stuff this weekend, but hated it all. I think all that 6th grade math is affecting my ability to be artsy. But I spent a lot of time in there telling myself and the kid, "Don't bother me, I'm making something." too cute! 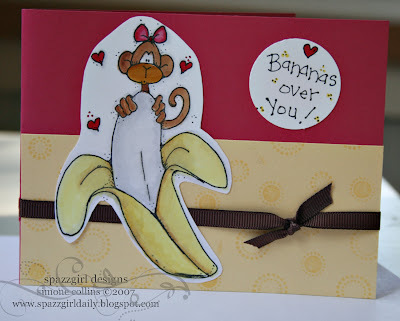 lol about the banana...yea your mind's in the gutter all right, but now that you say it...I think that's Inky Antics & the ladybugs stampendous? Making a mess! LOL! In that case, I am ALWAYS making something. That monkey with the banana is sooooooo cute! Great cards for someone who is suffering from logical side brain syndrome. I love the ladybug card. That stamp is from Stampendous. Love both of them! very cute cards! fantastic cards!love the bright colours you have used. Those are both wonderful cards and you are rockin' the COPICS!